As far as I know I am the only news reporter to have done a TV interview with Abigail Kawananakoa in which she talks about how she intends to distribute her fortune after her death to help the Hawaiian people. The interview was conducted in the throne room of Iolani Palace on Oct. 3, 2007, when I was a reporter for KITV News. Kawananakoa’s fortune at the time was estimated to be $300 million. Today it is $220 million. “All I can say is for the rest of my life and whatever means I have at my disposal I will use for the benefit of the Hawaiian people,” she said in the interview. Of course, I watched with great interest the carefully produced new video interview with Kawananakoa released to the media Thursday by CommPac, a Honolulu public relations firm Kawananakoa paid to make the production. In the new video, Kawananakoa says that she is “very fine” and perfectly able to take care of her own financial affairs. Kawananakoa and her wife, Veronica Gail Worth, are in a court battle to regain control of the Campbell Estate heir’s $220 million estate after probate court Judge Robert Mark Browning ruled the 92-year-old Kawananakoa lacked the mental capability to make complex financial decisions. Kawananakoa suffered a stroke in 2017. Some people are worried now that the $100 million Kawananakoa earmarked for Native Hawaiian causes in her trust will end up instead in the hands of others. In November, an amended trust was submitted to the court for approval that is less clear about where the charitable money will be directed. I wondered about the goal of the new video. It is doubtful the judge would find a video made by a public relations firm compelling enough for him to say Kawananakoa is mentally fine and capable of managing her fortune with no need for a court-appointed guardian. Abigail Kawananakoa in the new eight-minute video released by a Honolulu PR firm. Wright is Kawananakoa’s former attorney and the successor trustee of her estate while the judge, with Wright’s concurrence, waits for First Hawaiian Bank to take over as successor trustee. Kawananakoa has sought to have Wright removed as trustee. 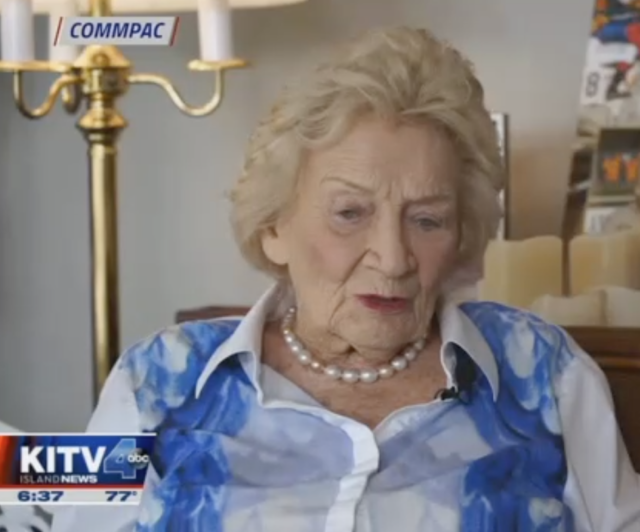 I spoke with CommPac CEO Kitty Yannone on Saturday to find out more about the video. I wondered if Kawananakoa’s answers in the new video were rehearsed and how much controversial material had been cut out of the original one-hour interview. Yannone said the interview at Kawananakoa’s Nuuanu home Jan. 15 was edited down to eight minutes, mainly to remove statements Kawananakoa made about her ongoing court case that could be seen as a violation of a court-imposed gag order that prevents her from discussing the case in public. Yannone said there was no prior rehearsing because interviewer Tannya Joaquin’s line of inquiry was revealed only when she showed up the day of the interview and the filming began. I know Kawananakoa’s answers in my interview were spontaneous and unrehearsed because I was at Iolani Palace to interview her about another issue when I decided on the spur of the moment to ask her about her finances. In my interview, Kawananakoa was direct and very clear about where she wanted her money to go after her death. She said she intended to donate funds to insure that Hawaiian history was taught in an authentic way using primary sources such as documents and letters, not from the secondary sources so often employed in classrooms today. She said she would also give funds for the protection and advancement of Hawaiian hula, a cultural tradition she worried had become commercialized to please visitors to the islands. In addition, she said she would fund institutions furthering the instruction of the Hawaiian language which she worried had become slangy and not authentic. Of course, that interview was 11 years ago and Kawananakoa had not yet suffered a stroke. 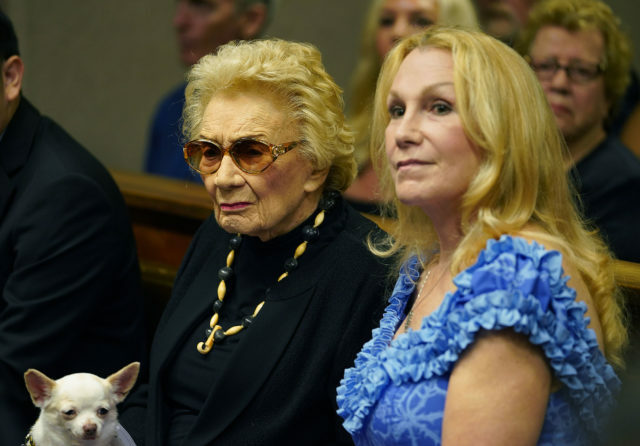 Kawananakoa with her wife, Veronica Gail Worth, and her chihuahua, Girlie Girl, in court last September. In the new video interview, Kawananakoa looks elegant but she is not her old sharp self. At the beginning she kept repeating herself. She says three times how grateful she is for the opportunity to tell her side of the story, twice thanking Joaquin for providing her with the opportunity when it was Kawananakoaʻs own money that provided the opportunity. Joaquin was working on contract for Ryan Kalei Tsujiʻs RKT Media Hawaii, which was hired by CommPac to make the video. That is what Gertrude said in Shakespeare’s Hamlet. It is a phrase used today when doubting a person’s sincerity. In other parts of the interview, Kawananakoa seemed scripted, far from the intelligent, funny woman I always enjoyed speaking with. Kawananakoa is noted for her unscripted life, both to her glory and her detriment. In 1997, she had to file for Chapter 11 bankruptcy protection after being more than $5 million in arrears to the IRS for unpaid taxes, penalties and interest. But on many other occasions her life off script has resulted in great kindness and generosity, such as spontaneous donations she made often anonymously to people in need she would read about in the newspapers. Wright said she was particularly touched by families struggling to pay medical expenses for their critically ill children or people who did not have enough money to pay for their relatives’ funerals and burials. One memorable off-script moment happened in October 2007, when Kawananakoa spontaneously bid $100,000 at an Iolani Palace fundraiser auction for the right to host a fancy dinner on the palace terrace with food by chef Alan Wong and music by the Brothers Cazimero. Afterward, she refused to host the party, saying the purpose of of her winning bid was to see that the party never happened. She called the idea of renting out parts of Iolani Palace sacrilegious; crass like Bill and Hillary Clinton accepting money from donors eager to sleep in Abraham Lincoln’s bedroom. In the new video, I wished to see her old spirit. But she was subdued. 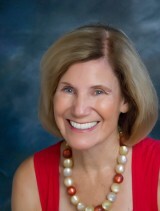 She said Veronica Gail Worth knows better than to get involved with her plans to help the Hawaiian people. On Friday, Judge Browning will hold a status conference in his chambers to discuss the progress of the case. Kawananakoa’s new TV video is expected to be among the items on the agenda for discussion.